No. 460 Squadron is a Royal Australian Air Force intelligence unit active within the Defence Imagery and Geospatial Organisation (DIGO). 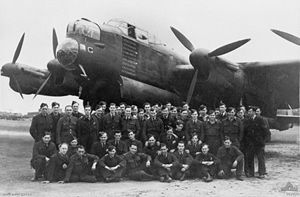 It was first formed as a heavy bomber squadron during World War II on 15 November 1941 and disbanded on 10 October 1945 after seeing extensive combat over Europe. The squadron was a multinational unit, but most personnel were Australian. No. 460 Squadron was reformed on 2 July 2010 and is currently located in Canberra. In front of a boomerang in base a kangaroo salient. The kangaroo is a fast and powerful animal indigenous to Australia, and the boomerang is a weapon peculiar to that country. No. 460 Squadron RAAF was formed from 'C' Flight of No. 458 Squadron RAAF at RAF Molesworth, Huntingdonshire on 15 November 1941, as a bomber squadron equipped with Wellington Mk.IV aircraft. Originally part of No. 8 Group RAF, Bomber Command, the squadron moved to RAF Breighton, Yorkshire and joined No. 1 Group RAF. The squadron made its first raid, against the German city of Emden, on 12 March 1942. The following night, five crews from the squadron participated in a raid on harbour facilities around Dunkirk, during which the squadron suffered its first losses of the war when one Wellington was shot down. A six-week "apprenticeship" period followed until the end of April 1942, during which the squadron was assigned mainly to attack less heavily defended targets on the French Channel coast; nevertheless, the squadron also undertook several attacks against targets in Germany during this time also. The squadron's first three months of operations saw it carry out 34 raids. For each raid, at least two aircraft were contributed, with some raids seeing as many as 10 aircraft taking part; a 30 May 1942 raid on Cologne saw 18 aircraft from No. 460 Squadron assigned. A total of six crews were lost during these raids. Losses between June and August amounted to 20 aircraft, and at the end of the period the squadron began to convert to Halifax Mk.IIs, but in October the squadron was re-equipped with Lancaster Mks. I and III. The following May, No. 460 Squadron relocated to RAF Binbrook, Lincolnshire, from where it participated in the strategic bombing of Germany. In late 1943 and early 1944, the squadron flew sorties in the Battle of Berlin. During the spring and summer of 1944, the squadron flew many missions in support of the D-Day landings. Its final raid was an attack on Adolf Hitler's mountain retreat of Berchtesgaden on Anzac Day, 1945. In May, No. 460 Squadron joined Operation Manna, the transportation of relief supplies to starving Dutch civilians. The squadron moved to RAF East Kirkby, Lincolnshire, in preparation for re-location to the Pacific theatre, as part of a proposed Commonwealth strategic air force known as Tiger Force, for the invasion of Japan. The move became unnecessary following the atomic bombings of Hiroshima and Nagasaki and No. 460 Squadron disbanded on 10 October 1945. The squadron flew the most sorties of any Australian bomber squadron and dropped more bomb tonnage than any squadron in the whole of Bomber Command—24,856 tons, which it dropped over 6,262 sorties. In doing that it lost 188 aircraft and suffered 1,018 combat deaths (589 of whom were Australian). This was the most of any Australian squadron during the war, with No. 460 Squadron effectively wiped out five times over its existence. RAF Bomber Command represented only two percent of total Australian enlistments during World War II, but accounted for almost 20 percent of personnel killed in action. Total Bomber Command losses were 55,573 for all nationalities. Members of 460 Squadron and the Lancaster bomber "G" for George in August 1943. No. 460 Squadron is commemorated at the Australian War Memorial by a display featuring its only surviving aircraft, G for George. This aircraft made 90 operational sorties between late 1942 and mid-1944. There is a memorial to the squadron on the site of the former RAF Binbrook, in Lincolnshire, UK, consisting of a plaque, trees and various memorial benches. There are also memorials in a number of other countries including Denmark, France, the Netherlands (Grafhorst) and Germany, marking the sites of where squadron aircraft crashed or individual crew members were killed. On 1 April 2010, then Chief of Air Force Air Marshal Mark Binskin announced that No. 460 Squadron was to be reformed as a non-flying squadron within the Defence Imagery and Geospatial Organisation (DIGO). The squadron was subsequently re-established on 2 July at a ceremony held in front of G for George at the Australian War Memorial. No. 460 Squadron is currently located in Canberra. Its roles include analysing photos and other imagery to help plan strike missions. "G" for George at the Australian War Memorial, Canberra. 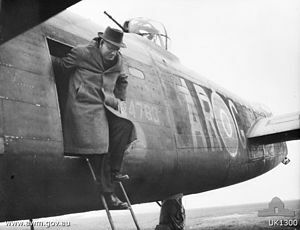 Binbrook, United Kingdom, April 1944: Mr John Curtin, Prime Minister of Australia, getting out of the veteran Lancaster "G" for George, during his visit to 460 Squadron RAAF. 460 Squadron is remembered as part of the 2007 Anzac Day Parade in Brisbane. ^ a b c d e f g Moyes 1976, p. 254. ^ Moyes 1976, pp. 302, 304, 306. ^ a b c d e f g Halley 1988, p. 480. ^ Bowyer & Rawlings 1979, p. 103. ^ Flintham & Thomas 2003, p. 114. ^ Bowyer & Rawlings 1979, p. 17. ^ Flintham & Thomas 2003, p. 63. ^ Firkins 2000, pp. 1–2. ^ a b Firkins 2000, p. 9. ^ Firkins 2000, p. 15. ^ Firkins 2000, p. 21. ^ a b c "No. 460 Squadron RAAF". Second World War, 1939–1945 units. Australian War Memorial. Retrieved 19 October 2013. ^ Oakman, Daniel. "The Battle of Berlin". Wartime Magazine. Australian War Memorial (25). ^ Barnes 2000, p. 299. ^ Bungay 2010, p. 64. ^ "No 460 Squadron". RAAF Museum. Retrieved 20 October 2013. ^ "G for George". Australian War Memorial. Retrieved 20 October 2013. ^ "460 Squadron: Memorials". Retrieved 20 October 2013. ^ "RAAF Celebrates 89 Years". Media release. Australian Department of Defence. 1 April 2010. Retrieved 1 April 2010. ^ "No. 460 Squadron RAAF reformation ceremony". Media gallaries. Department of Defence. Retrieved 2 July 2010. ^ a b Harrison, Dan (3 July 2010). "The motto of No. 460 lives on, as legendary squadron returns". The Sydney Morning Herald. Retrieved 3 July 2010. ^ a b Jefford 2001, p. 95. ^ Cowan, Brendan. "Avro Manchester". ADF Serials. Retrieved 28 February 2019. ^ Firkins, Peter. "History of 460 Squadron". Gordon Stooke's 460 Squadron Website. Retrieved 19 October 2013. Barnes, Norman (2000). The RAAF and the Flying Squadrons. St Leonards, New South Wales, Australia: Allen & Unwin. ISBN 1-86508-130-2. Bungay, Stephen (2010). The Most Dangerous Enemy: An Illustrated History of the Battle of Britain. MBI Publishing. ISBN 9780760339367. Firkins, Peter C. (2000) . Strike and Return: 460 RAAF Heavy Bomber Squadron, RAF Bomber Command in the World War (3rd ed.). Loftus, New South Wales: Australian Military History Publications. ISBN 1-876439-84-X. Halley, James J. (1988). The Squadrons of the Royal Air Force & Commonwealth 1918–1988. Tonbridge, Kent, UK: Air Britain (Historians). ISBN 0-85130-164-9. Hoyle, Arthur R. (2012). David Vernon (ed.). Into the Darkness – One Young Australian's Journey from Sydney to the Deadly Skies Over Germany 1939–1945. Canberra, Australian Capital Territory: Stringybark Publishing. ISBN 978-0-9870922-7-4. Jefford, C.G. (2001) . RAF Squadrons: A Comprehensive Record of the Movement and Equipment of all RAF Squadrons and Their Antecedents Since 1912 (2nd ed.). Shrewsbury, Shropshire, UK: Airlife Publishing. ISBN 1-85310-053-6. Moyes, Philip J.R. (1976). Bomber Squadrons of the RAF and their Aircraft (2nd ed.). London: Macdonald and Jane's (Publishers). ISBN 0-354-01027-1. Nelmes, Michael V.; Jenkins, Ian (2000). G-for-George: A Memorial to RAAF Bomber Crews, 1939–45. Maryborough, Queensland: Banner Books. ISBN 1-875593-21-7. Stooke, Gordon (2005). Flak and Barbed Wire: In the Wake of Wuppertal. An Australian's Story of Escape and Betrayal. Loftus, New South Wales: Australian Military History Publications. ISBN 0-9586693-2-5. Taylor, Assheton F. (2000). One Way Flight to Munich: Memoirs of a 460 Squadron (RAAF) Navigator. Loftus, New South Wales: Australian Military History Publications. ISBN 1-876439-37-8. Woods, Laurie (2003). Flying into the Mouth of Hell. Canberra, Australian Capital Territory: Boolarong Press. ISBN 0-646-33267-8. Wikimedia Commons has media related to No. 460 Squadron RAAF.